Evan Jager competes in his qualifying heat at the 2015 World Championships. He’ll use this weekend’s USATF Indoor Championships to practice racing tactics for his 2016 outdoor season. Photo by PhotoRun. 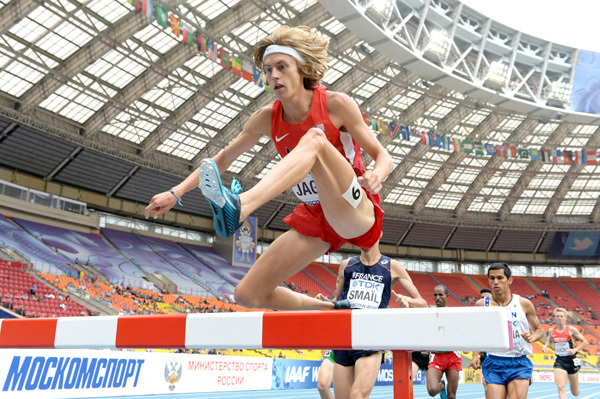 As is fitting for a specialist in a race involving 28 hurdles and seven water jumps, Evan Jager likes to look ahead, not back. Instead, Evan’s thoughts are totally oriented toward the summer of 2016. For Evan, this weekend’s USATF Indoor Championships are a means to those big-picture ends. That both meets will be held in his training base of Portland, Oregon, simplified the decision to run a brief indoor campaign. To get his qualifier for the meets, Evan placed fourth in the 3,000 at the Millrose Games on February 20. His time of 7:40.10 was just off his indoor PR for the distance. That high level of fitness will be crucial to Evan’s goal of medaling in the Olympics. At last summer’s world championships, he led with one lap to go, perfectly positioned in the outer part of the first lane. But over the last 250 meters, he was unable to match the closing sprint of eventual winner Ezekiel Kemboi and the three other Kenyans in the race, and finished sixth. Months later, Evan says he meant both fitness and racing tactics when discussing how to get on the podium in a global championship. “I believe I have to be able to use race tactics that benefit my strengths, and in order to do that I need to be the fittest I have ever been so that I can follow through with those tactics,” he says. So while Evan is looking forward to competing indoors in Portland this weekend, he has the much bigger events of the summer fully in sight. YOUR A GREAT RUNNER, PERSON, AND ROLE MODEL FOR ALL YOUNG R-ATHLETES EVERYWHERE CAN LOOK UP TOO.S-TRAIN HARD, STAY CLOSE TO GOD,YOU CAN RUN 7:49 IN STEEPLE, U ALSO R WELL CAPABLE OF RUNNING A 3:46 MILE AND 1:43-1:44 800. GO GET THE GOLD, AND YOUR DADS A REAL AMERICAN WAR HERO, THANK YOU, GODBLESS DRUG FREE ATHLETES RULE THIS PLANET IN 2016.